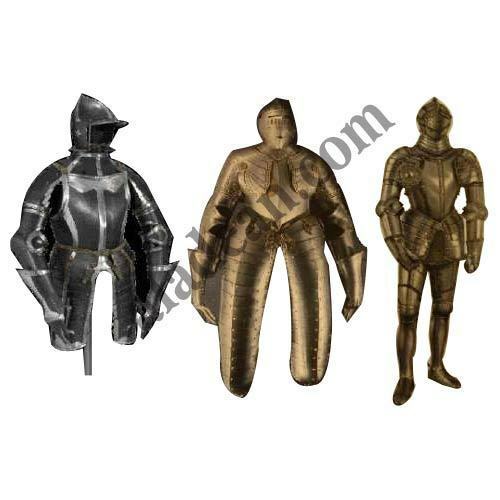 Our company is one of the leading wholesaler and trader of full body suits of armour which are known from their special features like high durability, ling service life and eye-catching design. Our skilled professionals made these armour from premium quality of metals like mild steels and brass etc. These are available in various sizes and in fully wearable and miniature size. Our product range is quite famous for its fine finishing, corrosion proof, light weighted and resistance to oxidization etc. Our client can avail with a very competitive price as per their requirement. Aladean TM from the house of S A Enterprises is the leading brand offering a vast collection & variety of Indian Handicrafts. A highly professional company making the wholesale / bulk orders very simple for the clients, Read our customer reviews before you place your order. We have inhouse manufacturing of most of the items we sell. Strong quality checks are applied to ensure 100% satisfaction. We commit what we can deliver "Quality Products at best prices delivered on time"
Browse our website with ease, products are categorised and have detailed descriptions along with clear images. If you are looking for a customized item and do not find it on our website, do not worry, Simply attach an image in the contact us form and send us your exact requirement and we will create it for you. We offer 100% customization in all our products and you can get your company name, logo or a custom text engraved on the product surface.